Alliance will install rodent bait stations to the exterior of your building. In most case on each side of exterior doors as well as 30′ apart and at dumpster locations. These stations are anchored to the ground, locked shut, as well as documented with an ingredient card / service record. These stations are serviced every month and activity found will be documented on each service report. In Food & Beverage accounts bar-coding is put in place on all rodent bait stations for reporting purposes. Trend reports of rodent station findings will be available to you on the Customer Portal as well as all past invoices, and service reports. 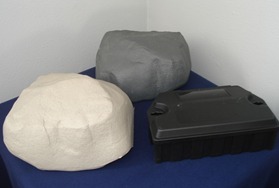 Several bait stations designs are offered such as (the rock) for sensitive areas where we need to be discreet. In most cases your customer will not know what they are.